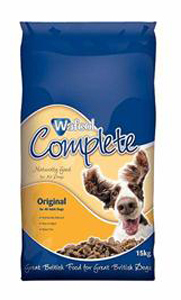 What more can we say about Wagg dog foods. They've been making pet foods for 25 years, have some good marketing, attractive packaging and the food is readily available in supermarkets, at a price which is somewhere in the middle between cheap and premium. 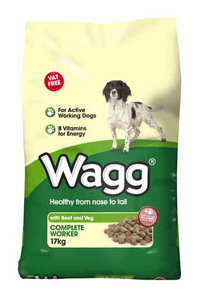 The basic Wagg food is based around wheat and mixed meat meal, but in its favour is a reasonable retail price. The Wagg Sensitive food is much nearer to a natural food, albeit that they seem to use a mix of meat meal, presumably to keep costs lower. As a result it may not suit all owners who want to know exactly what's in the food, but it seems quite good value for what it is. Expect to pay £13 for a 17kg sack of the basic Worker food, and £17 for 12kg of the Sensitive food. Maize, Meat Meal, Rice (min 5%), Porridge Oats (min 5%), Chicken Meat Meal (min 5%), Beet Pulp, Digest, Poultry Fat, Linseed, Minerals, Yeast (0.1%), Citrus Extract (0.04%), Yucca Extract (0.01%). Additives (per kg):Vitamin A (E672) 10,000 iu, Vitamin D3 (E671) 1,000 iu, Vitamin E (alpha tocopherol acetate) 90 iu, Vitamin C (ascorbyl monophosphate) 40 mg, E1 Iron (iron III ferric oxide) 1200mg, E2 Iodine (calcium iodate) 2 mg, E4 Copper (cupric sulphate pentahydrate) 10 mg, E5 Manganese (manganous oxide) 50 mg, E6 Zinc (zinc oxide) 40 mg, E6 Zinc (zinc chelate) 60 mg, E8 Selenium (sodium selenite) 0.1 mg, Antioxidant, Preservative. Wheat, Meat Meal (min 10% beef in red kibble), Wheatfeed, Poultry Fat, Digest, Vitamins and Minerals, Linseed, Beet Pulp, Peas (min 4% in pea kibble), Maize, Lucerne, Yeast (0.08%), Citrus Extract (0.03%), Yucca Extract (0.01%).